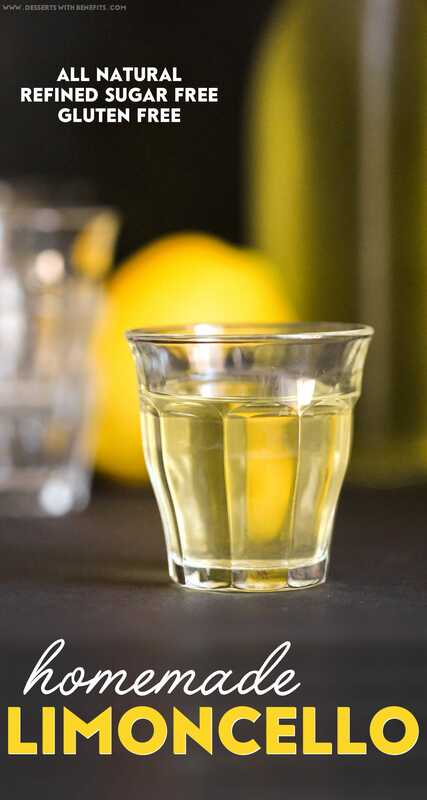 Limoncello (pronounced like lee-moan-cheh-low) is an Italian sweet lemon liqueur that is often served chilled as a palate cleanser or after-dinner drink. Sadly, most varieties that you’d find at the store aren’t natural in the slightest. Do you get sad when you’re tryin’ to get your drank on and see “FD&C Yellow No.5” or “Color Added” written on the label? I know I do. Well, suffer no more as I have made this Healthier Homemade Limoncello! Unlike storebought varieties, this Healthier Homemade Limoncello is made without the artificial food coloring, corn syrup, and preservatives. Yup, Limoncello JUST. GOT. BETTER. This homemade Limoncello is all natural, low calorie, refined sugar free, fat free, gluten free, dairy free, and vegan too. It sounds like I’m describing broccoli, but no, I’m talking about this DAMN GOOD lemon liqueur. The only downside to this recipe is that it takes 20 days to make. The lemons need to completely infuse the vodka with sweet, refreshing lemon flavor. It’s kind of like the lemons are “steeping.” But don’t worry, those 20 days will be over soon enough. 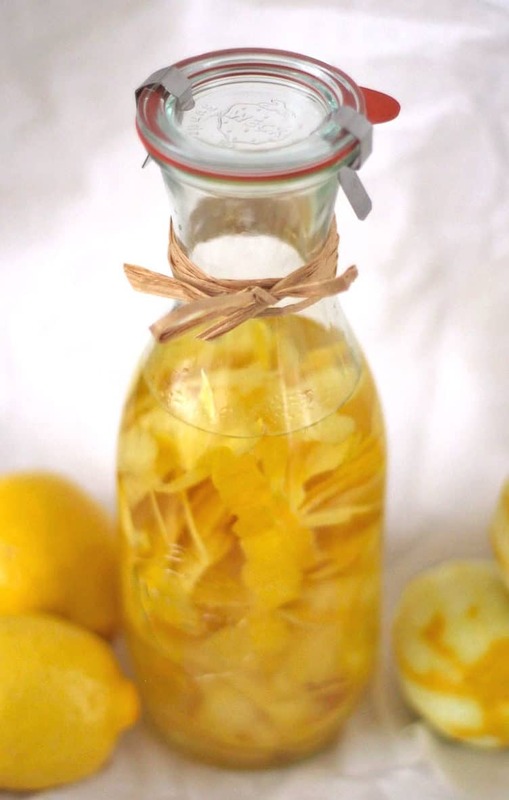 Pour the finished Limoncello (aka liquid gold) into jars and refrigerate to store. Buuuut you can totally drink some now because you waited 480 long hours for this moment! Once you have a sip, you’ll know that the wait is SO so worth it. Trust me. Limoncello is an Italian sweet lemon liqueur that is often served chilled as a palate cleanser or after-dinner drink. Sadly, most kinds at the store are made with artificial food dyes and refined sugars. 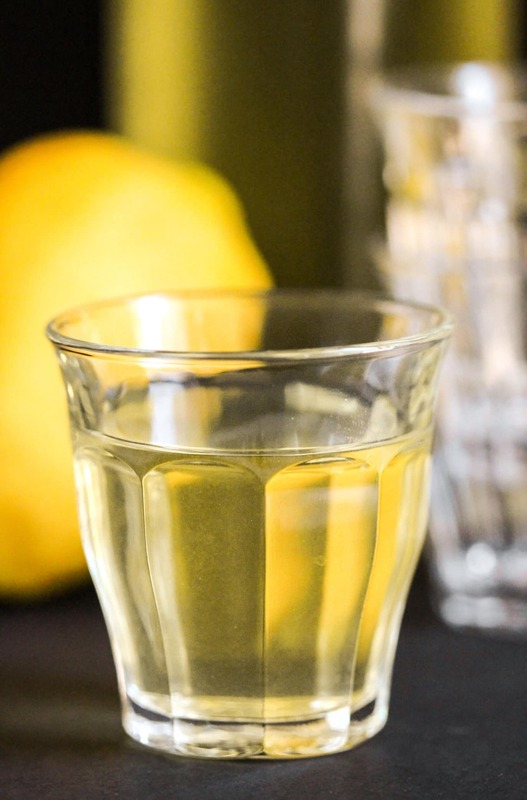 So I made a better option -- this Healthier Homemade Limoncello! Peel the lemons with a vegetable peeler (just enough to get the yellow skin off). Place the peels in a very large jar (or a big old vodka bottle). Pour in the vodka and water. Seal tightly and store in the fridge for 20 days (no need to mix, shake, or stir). Strain the mixture through a coffee filter, into a very large bowl. Discard the lemon peels and the filter. 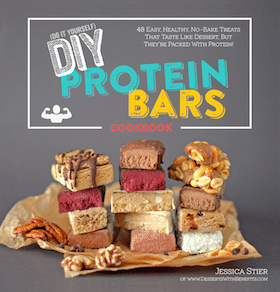 Whisk in the agave nectar, stevia extract, and lemon flavor. Give it a taste and add more agave if you think it needs it. Pour the Limoncello into jars and refrigerate to store. And it tastes just as amazing. HAAAALLELUJAH! Why yes, I will take another shot, please and thank you. But really now, you should start a batch of this ASAP. You never know when you may need it. You will be sipping on this amazingness soon enough. Bottoms up! Yuck, the nutrition facts for the original are scary. I really want to try your version!! Should the water be warmed to dissolve the sugar and let cool before adding to lemons? I’ve made Limoncello too. I use 4 cups of sugar to 4 cups of water per bottle of everclear. After the end. I freeze it. It is so good. Refreshing. Freezing is probably better than just refrigeration. I am going to try this this year. I had some last year at holiday party and I know being a diabetic i could buy this but now I just have to have it. Thanks and Happy and Holy days this year. How did you find out that this was gluten free? 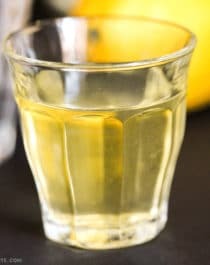 Ciao, I am from Italy and I love the idea of making limoncello substituting the huge amount of sugar with Stevia, to make it much lower in calories. However, the original recipe for limoncello calls for rectified spirit, which is a highly concentrated ethanol (190 proof), instead of vodka. In addition, if you want to have good results, the infusing time is much longer than 12 days. Specifically, the lemon zest should be soaked in 3 cups of alcohol (the rectified spirit) in a airtight glass container, in a dark cool place for 30 days. Then, you can make the sweet syrup by bringing water to boil and dissolving the sugar (in this case Stevia) in it. When the syrup has cooled off, it should be added, together with another cup of rectified spirit, to the alcohol + lemon mixture in the airtight container, again in a dark cool place. After 40 days, you can filer the content put it in the freezer and enjoy. I used a lemon-flavored vodka in this recipe to cut down on the lemon-steeping time, and also because I could not find Everclear (190 proof) in my area. I also like the taste of the Smirnoff vodka and find that the lemon flavor comes through just fine after 12 days. You can definitely infuse it for longer if you wish. I put the steeping mixture in the fridge because I live in Arizona and it’s still quite warm here, other wise you can leave it in the pantry or somewhere dark/cool. Stevia in the Raw dissolves readily into water unlike sugar, which will crystallize and taste pretty bad! This looks beautiful!! I bet this would be amazing in so many recipes too! Also, my sisters and I nominated you for a blog award on our site today. Hope you check it out. Thanks for the great recipes. Our mom has even tried some of your recipes and loved them. 🙂 Keep up the great work!! I’m so glad your mom liked my recipes! I always get anxious and wonder if people don’t like them… everybody has completely different tastes so I get totally paranoid lol. Yeah! I wanted a natural recipe for lemoncello! So so glad you are here♡ I’ll be starting it in the morning. I frequently use liquor for extracts in cooking, baking etc. I am allergic to artificial dye, so yes I learned the hard way after a reaction to store bought 🙁 so gave it away, new natural hunt came up with your wonderful site, THANK YOU. 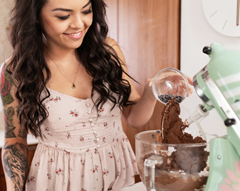 I’ll be trying many other recipes in the near future from your collection. 🙂 glad I found you. i’m so glad someone has already made limoncello with stevia! I have my lemon peels steeping and will give it a try! Although, limoncello as a digestif is quite a strong alcoholic drink and when substituting 40% vodka for 80% spirit i would recommend using a lot less water (or not at all). Since it’s basically pure alcohol, it can store for a while in a tightly sealed container in the fridge. I’m not sure about the exact length of time, but I’d assume around a few months? Any idea how you can make a creamy version of this? Let me know if you come up with someway to make it creamy. I’ve never had Cremoncello so I’m not sure how it tastes. From what I read online, it looks like it’s just Limoncello + heavy cream? If that’s all it is, I guess you can try mixing some of this Limoncello with organic heavy cream. 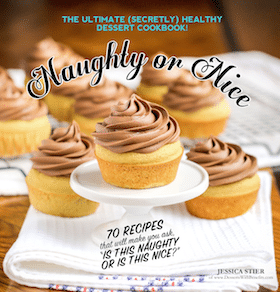 The calories will go up a bit from the cream, but it will still be sugar-free and low-carb! Oh the ice cream sounds great! Can’t wait. Thank you! Cremoncello is just a creamy version of Limoncello. I will try the organic cream. I was also thinking maybe using some unsweetened coconut milk…might make an interesting taste. Just got the recipe for the ice cream! YUMMY! Can’t wait to make it. Agave nectar is 66% sugar. I suggest you check your claims aboyt both calories and sugar. You are correct that agave nectar is a sweetener, however the recipe only calls for 1/4 cup which is spread throughout the entire batch (makes 7+2/3 cups TOTAL). Also never claimed that this recipe is calorie free… I said it’s lower calorie than storebought Limoncello, which IS basically pure sugar. I feel silly asking but is there a substitute for the alcohol? I’m pregnant. Any ideas would be appreciated. Hi what about using honey VS agave/stevia? Lemon flavor? Extract? Lemon juice?